Let's welcome another new guest reviewer tonight - Max Scoville! 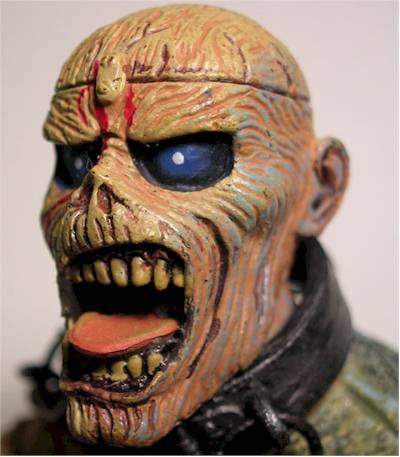 Max brings us a review of the Eddie figure from NECA's Iron Maiden line. What's the info, Max? If you’ve been even remotely aware of music in the past 25 years, there’s a good chance that you’ve heard of the heavy metal band Iron Maiden. If you’ve seen one of their album covers, you’ve seen the band’s mascot, Eddie. Eddie is pretty much a zombie who sees a different outfit/incarnation on each cover, and NECA recently got the right to produce action figures based on him. The first series consists of two seven inch figures and one eighteen inch figure, based on the album art from Piece Of Mind (1984) and Somewhere In Time (1986). The latter is produced in both scales, while Piece Of Mind Eddie is only available in seven-inch form. I had the pleasure of seeing Iron Maiden live last month, and stumbled across the action figures a few weeks after that in Spencer Gifts. I couldn’t resist, so I shelled out 12.99 for Piece Of Mind Eddie, which I am extremely satisfied with. I apologize for the lack of pictures of a MISB Eddie, but you’re not missing much. NECA stuck with their current trend of clamshell packaging, which is great and sturdy if you keep figures carded, but is something of a hassle if you just want the action figure. The size of the package seems a bit large to me, but it displays the figure well. It is adorned with two stickers that identify the figure. It’s probably the most ideal all-around packaging since it looks alright, but not so alright that you’ll feel bad ripping it to shreds. Here’s one of the areas in which this figure really impresses. The sculpting is pretty dead-on to the original album art, and it works well with the articulation - then again, with three points of articulation, I’d be concerned if it didn’t. More on that later. The face is a bit more elongated than the album art, but I didn’t really notice it before I did a side-by-side comparison. It’s a solid sculpt overall, but there are a few spots that absolutely shine. 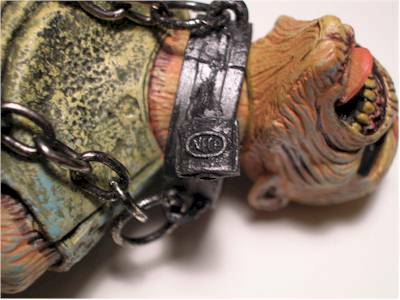 For instance, if you look really closely at the lock on his shackles, you’ll see that in place of a keyhole there’s a small seal that reads “NECA.” I thought that was rather ingenious, as the source material doesn’t go as far as to show the lock in that detail. 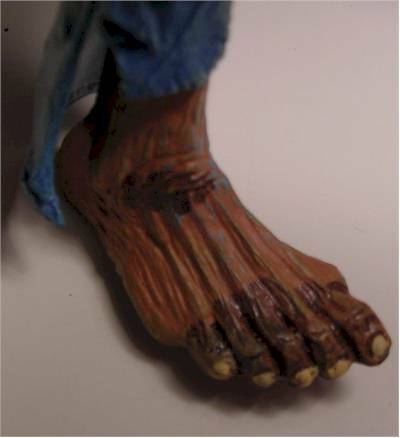 I also noticed how entirely disgusting Eddie’s feet look. I mean that in a good way. They’d give a podiatrist nightmares – Hah, feet dreams. Ahem. Sorry. For the most part, this figure exhibits very clean and accurate paint-ops, but as with any mass-market figure with this level of detail, there are a few sloppy spots. 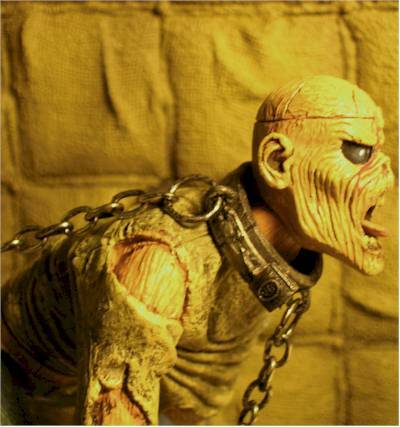 Most noticeably on the shoulders, where the flesh-colored paint overflows onto the torn seams of the straight-jacket. Another spot that drew my attention was the right shin. Eddie somehow managed to tear his jeans a good deal, and his leg is half-exposed, all of which looks great sculpt-wise, but there’s some grayish paint on his leg that’s such a close tone to the color of his jeans that it looks like a mistake. Upon close inspection, I realize that it’s supposed to be dead flesh. Overall, such minor nitpicks are really pretty excusable since this is such a chaotic subject to make an action figure of. Alas, here’s where Eddie’s score slumps. I’ve always been vehemently pro-poseability, which is one reason that I’ve avoided NECA before this figure. The label on the bubble claims Eddie has a ball-jointed neck and torso. The neck I’ve got no argument with. It’s got a good range of movement, and is tight without feeling fragile. The ball-jointed torso, however, I really don’t see. I can sort of tell that it’s intended to be ball-jointed, but it would have a better range of motion as a cut joint. In addition to the advertised joints, Eddie’s got a cut waist, which works fine... And um... Yeah, that’s it. I know the pose of the figure – and the straight-jacket – limits the options for articulation a bit, but I can’t help but feel a tad disappointed. I’m not asking for Marvel Legends, here, but a V-cut waist and cut ankles would probably earn Eddie another star. 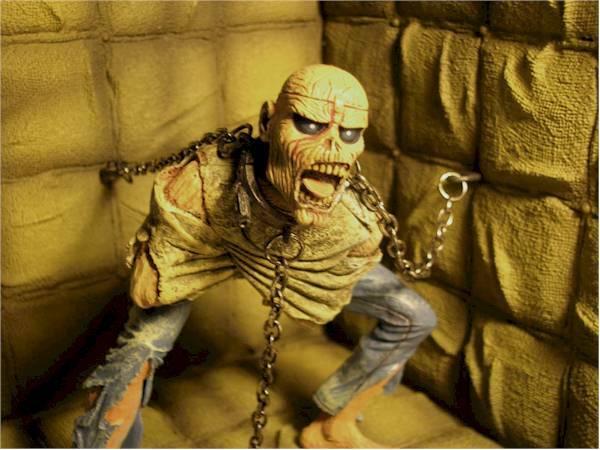 Eddie’s accessories consist of his chains and shackles, which are more or less permanently attached to his neck, and the three identical padded walls that form the “Custom Diorama Base.” The three chains are actual little metal chains, and each one ends in a ring that plugs into a small hole in the center of the wall/floor plates. The plates are identical and snap together easily, creating a nice base. 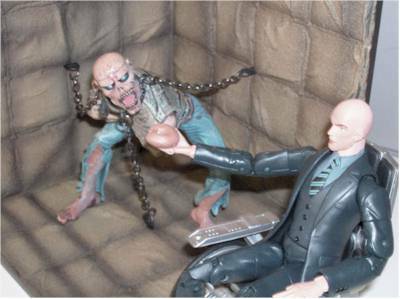 I don’t see how it’s a custom diorama, though. 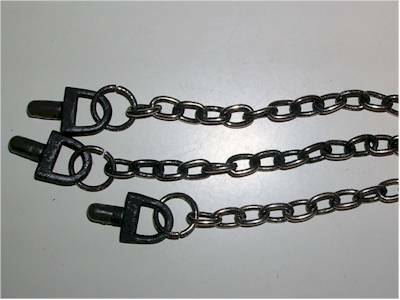 The chains actually have some paint-ops on them, which look great. Just for that, I’m adding a star. I’m really glad NECA went with painted metal instead of sculpted plastic. It made a noticeable difference. Not much here. This fella is for displaying. You give this to a kid and he probably won’t do much. Also, you’d be one twisted individual... or that’d be one awesome kid. Either way, not much playing going on with this guy. 12.99 is pretty fair. I would have no problem at ten bucks, but people seem to desire zombies more and more these days. Like I said, I picked mine up at Spencer Gifts, so a trip to a good mall should prove fruitful if you’re looking for an Eddie of your own. I imagine the Musicland family of stores have them in stock, or will pretty soon. If you’re a fan of Maiden, I strongly recommend picking up one of these lil’ guys to adorn your bookshelf, stereo, bedside table, or unholy altar of blasphemy. Anyone else who can dig an excellent sculpt, great paint, and an overall superb design would most likely get something out of this figure. Figure from the collection of Max Scoville.